Peggy Fletcher Stack pointed out in her article in the Salt Lake Tribune that this is just about feeding the status quo, but as my favorite doctor said, "The status is not quo." From the Trib article: "Ordain Women has made five formal requests for a meeting with LDS officials, sent to the church’s public-relations arm" with no response. The whole situation makes me think of high school. Did you ever have a friend that just wouldn't make plans with you? They always insist they are too busy, but then you find out that they just wanted to go to a party at the quarterback's house that night and didn't want to take you along. Well, I hope they have fun. I know what those parties are like. 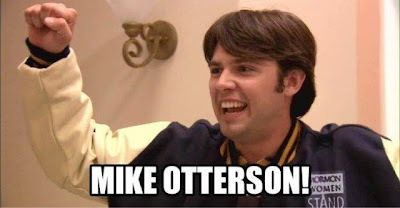 It's just a bunch of jocks high-fiving each other and laughing at bad jokes, shouting, "Michael Otterson!" Well, maybe the party is a poor analogy. The PR party is one that OW has been trying to get invited to for a long time, but I don't think we'll get much out of it for a while. Obviously, the jocks are looking for yes-(wo)men instead of asking the bigger questions. I'm curious about the so-called "women’s issues" discussed during the "treasured experience." Did they discuss how to better reach out in love and support to the intelligent women leaving the church? Did they wax philosophical about how to improve leadership opportunities for women in the Church? I doubt it, but I can't help hoping they at least considered us. Great post, Brooke. It seems so petty for the PR people to meet with MWS for--it appears--no other reason than to say "nyah nyah" to OW. Please! *This* is good PR?